Opposite the unfinished gallery mentioned in my last post is the village of He Ge Zhuang which has become an exemplar of refurbishing villages in traditional style but with contemporary facilities. The project is the work of the couple who run the very tranquil Orchard restaurant in the village and who have set up the YinYang community centre too ( a mixture of Western Psychotherapy practice, Traditional Chinese massage, pilates – somehow very New York and tranquil and chai latte). Tired of living in a gated compound of luxury villas? Wondering from the 27th florr of your downtown high-rise apartment whether is possible to live closer to nature? While expats have traditionally enjoyed a special status in China, some have described the gated community lifestyle as far too removed from the reality of the Middle Kingdom. ‘It’s so fake,’ we often hear people tells us. 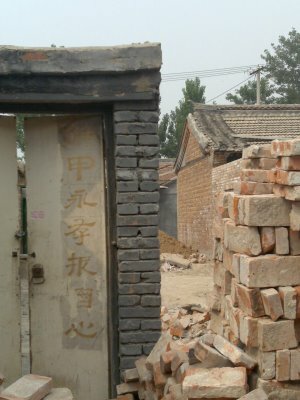 In 2007 the Real Life Beijing Co.,Ltd., signed contracts with the local government officials to renovate several courtyards in the village of Hegezhuang in Cuigzhuang Township. 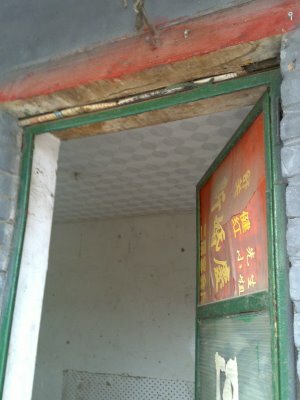 Most importantly, this project seeks to not marginalise the residents of Hegezhuang, but rather to improve the lives of both the villagers and the Real Life clients. Clients sign a long-term lease with the company which in turn provides a fair income to the village landlords. 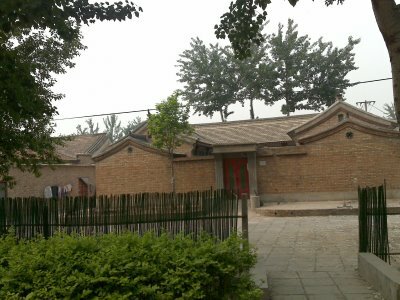 The clients, in turn, have the opportunity to enjoy a lifestyle not readily available to expats in Beijing, and which is protected by the Real Life company with official approval by the village and township governments. I wish them well but there are murmurs of anxiety in the brochure copy, little nodes of tension not far away: ‘a fair income’, a lifestyle ‘protected’, ‘official approval’. And the Real Life name sounds like the title of an organisation in some dystopian novel. The fact the village is surrounded by trees makes it particularly peaceful. 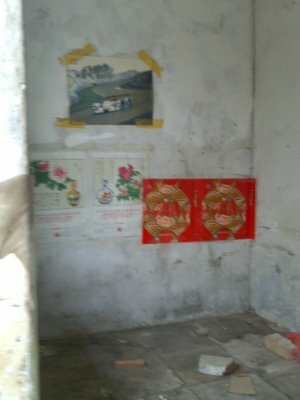 Some of the village houses seem empty awaiting renovation. It’s quite beautiful and I hope it works out for everyone. If you have any questions about the project that I and my husband have started, please feel free to ask me directly. I have no idea what you're implying about the brochure that I wrote. There is no anxiety other than what I feel when I read what you write about us. 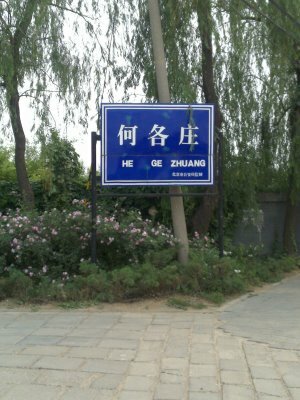 I've lived in Hegezhuang since 2001 and before that was living in Suojiacun starting in 1997. I've lived in Beijing for more than 15 years. What's the problem with us trying to save the village from being torn down? You need official approval to do what we're doing. That means a LOT of hard work over MANY YEARS. Villagers are paid more than they would ever make renting to a cluster of poor migrants that they have for the past several years stuffed into their courtyards, many of them without heat, water, adequate electricity or ventilation, with black mold. No one should have to live like that. If you feel for the migrants, then get involved in one of many groups in the city trying to help them. My plate is full. The village landlords don't have to rent if they don't want to. If they do, many of them will be able to earn a sustainable income that will help them to have savings, buy insurance, send their children to school, retire. They can choose to stay in another courtyard with relatives, use their rent money to buy an apartment or rent another place somewhere else. Foreigners want to live a more "real life" in a village setting, rather than in an apartment in Beijing, or in a gated villa community in the suburbs. There is no secret agenda. 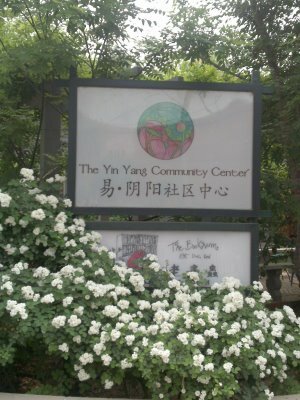 We just don't want Hegezhuang, The Orchard and The Yin Yang Community Center to be torn down. So we sought to try to save it. The result of eight years of efforts? 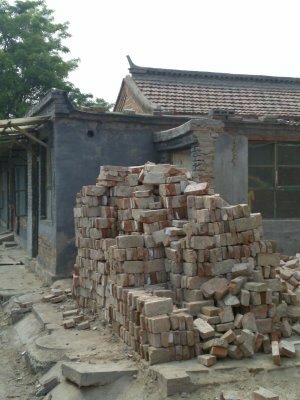 There are 15 villages in Cuigezhuang township; 14 of them are going to be torn down within three years. Guess which one gets to remain standing? This is the work of two people, working like HELL, for years. I take my responsibilities very seriously and I take offense at your careless treatment of a very serious and difficult endeavor. I’m an English guy, who is working in a new school opposite He ge zhuang. My wife and I are looking for a place near my school. 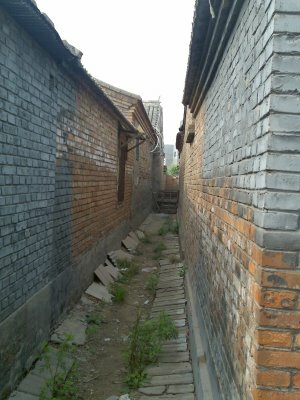 Are there any vacancies in the converted places in Hegezhuang? I'm sorry that you've taken such offense at two lines that reflect my perception of reading your brochure. Those two lines sit in the middle of a long post that is very positive about your project, about the spirit and beauty of the village and about the aspirations of your work there . I thought the Orchard, Hegezhuang and the Yin Yang Centre a refreshing oasis and I said that in the post. What my two lines point to is precisely the 'hard work over MANY YEARS' earning the necessary 'official approval' that you've had to undergo. It is the context of even this beautiful venture that I want to draw to my readers' attention.